This article will highlight only some of the significant changes or functional differences within the Interfolio environment. For a breakdown of the changes in the Faculty180 module, you are in the right place, please see below. For a breakdown of the changes in other Interfolio modules, please see our separate articles on Faculty Search, Review, Promotion & Tenure, or Dossier Deliver. After logging in, users with two or more accounts associated with their email address will be prompted to choose a homepage. 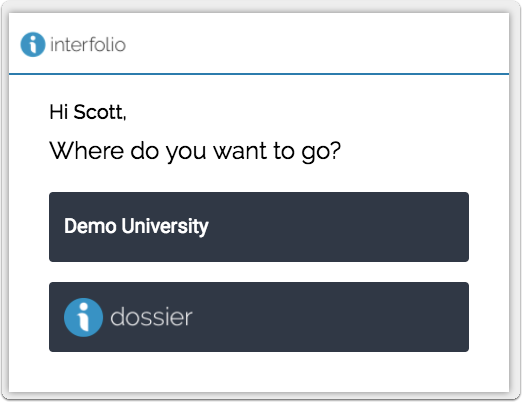 The Personal Interfolio Dossier Homepage - Where Faculty users can upload, organize, and manage their materials in a personal account. 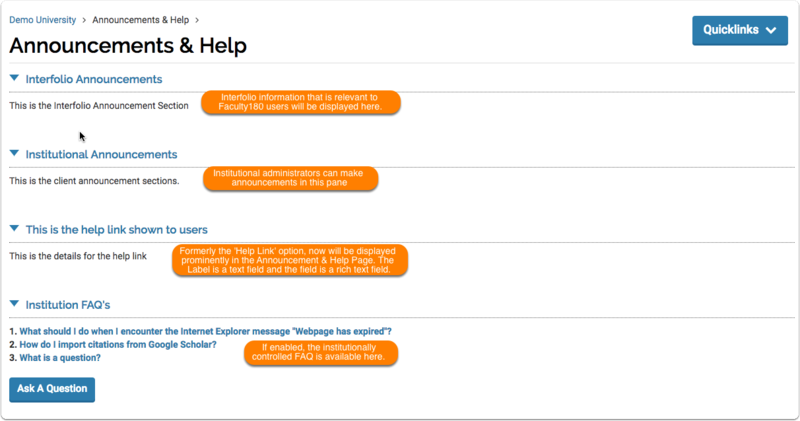 The Institutional Homepage - Where Institutional users can access institutional processes through Interfolio, such as hiring for positions, review/promotion cases, or faculty activity reporting. If users are part of more than one institution then more than one option will display. After choosing an option, this pane will appear at the top of the page to save the selection. Simply navigate to the User Menu in the top right corner, and then to the Account Settings option to update this configuration at a later date. 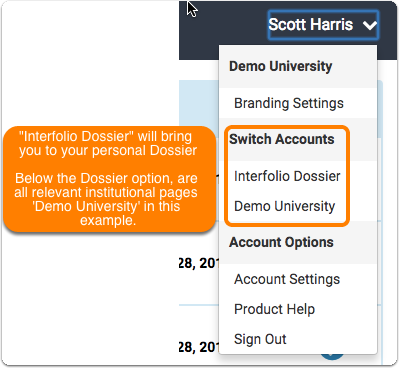 At this time, in order for a Faculty member to create their own personal Dossier account, they must do so outside of the Interfolio product. 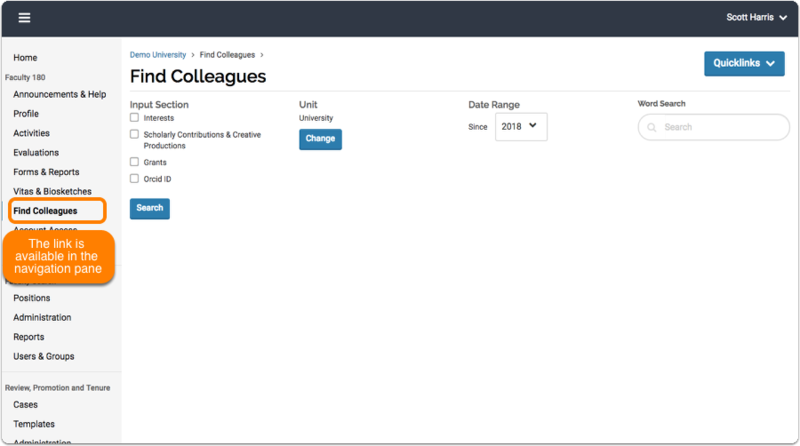 Below is an example of the new Dossier interface that will be available for all Dossier users when the release occurs. At the bottom of a user's Dossier Homepage, there is one featured Interfolio controlled help article and three featured blog posts on Interfolio article content for quick and easy reference. Available in the top right corner, select the button with the user's name. Access our Interfolio help site located here at product-help.interfolio.com. Access your personal Dossier settings and update your basic information. Easily switch to and from your institutional homepage and your personal Dossier. An account card tied directly to your Interfolio account information (located in the Account Settings), that displays a summary of information along with how many documents/applications/materials you have stored within Interfolio. Users with an SSO enabled account can authenticate using their own credentials, as set on their own personal Interfolio account of the same email address. When said user selects an institutional account that requires SSO authentication, they see a message on the account selection screen showing that they will be redirected to SSO. Then they click “Continue” button, and are taken to the SSO authentication page for the account they selected, after successfully logging in, they can access institutional specific data. All current and past, deliveries and applications, both inside and outside of Interfolio, are available from the Deliveries link in the sidebar. All letters of recommendation within your Dossier will be available in the Letters link. Whether you are a letter writer or an applicant, all letters will be available there for update or use.Confidential letters are always uploaded by the letter writer, and never viewable to the applicant. Materials that have been uploaded as part of a candidate packet, Faculty Search applications, or imported from Faculty180 will be available in the materials section of your personal dossier. Packet guidelines for RPT candidates will display on this page. Materials within your personal dossier can be put into groups called 'collections'. These collectons can be used in deliveries or other applications to allow you to create different packs of materials depending on the relevant use. If a user has Dossier Deliver or Dossier Institution, they can share documents with other Interfolio users, you can find all of them easily with the Shared with me tab. The action items in the center of the page will contain updates for every Institutional product, reducing the number of spots to look for updates or notifications within Interfolio. Users can use the User Menu in the top right corner, with their name displayed, to switch to their personal Dossier, to manage their personal Interfolio account settings, to access Interfolio help content, to log out, and more depending on an individual's permissions. The new Navigation Bar on the left hand side will feature the most relevant links for each Interfolio product, no matter what combination your institution uses. Previously these options had been located on the 'dashboard' or via the toolbar at the top of the page while within the specific product, or as in the case of Faculty180, were for a time completely independent from our other Interfolio offerings. In the sections below, there are close-up examples of the navigation panels for each Interfolio product's navigation pane. Users will only see the options they have access to, and no more. In these examples, all options for all products are shown. 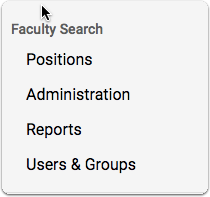 Navigate to view the positions page where users can view all of the searches that they have access to within Interfolio Faculty Search that the user has access to view. 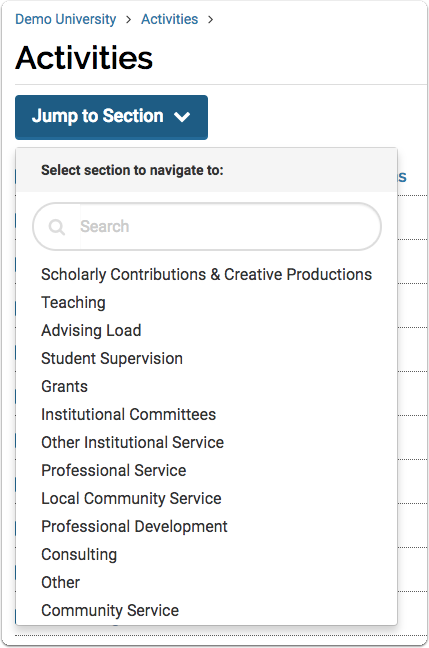 The Administration page is available to users with the proper permissions and is where they set institutional and unit specific settings to apply to position searches within Interfolio Faculty Search. Users with the proper permissions can access all available reports from the Reports page located on the navigation bar. Manage permissions and give access to additional users via the Users & Groups page from the navigation bar. Navigate to view the cases page where users can view all of the workflows and processes that they have access to. The Templates page is available to users with the proper permissions and is where they set institutional and unit specific templates to save time and quickly clone. 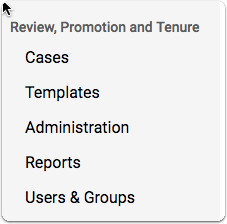 The Administration page is available to users with the proper permissions and is where they set institutional and unit specific settings to apply to position searches within Interfolio Review, Promotion, & Tenure. Manage permissions and give access to additional users and committees via the Users & Groups page from the navigation bar. Only users with the relevant administrative access will see all options displayed above. More information about the Faculty180 updates below. 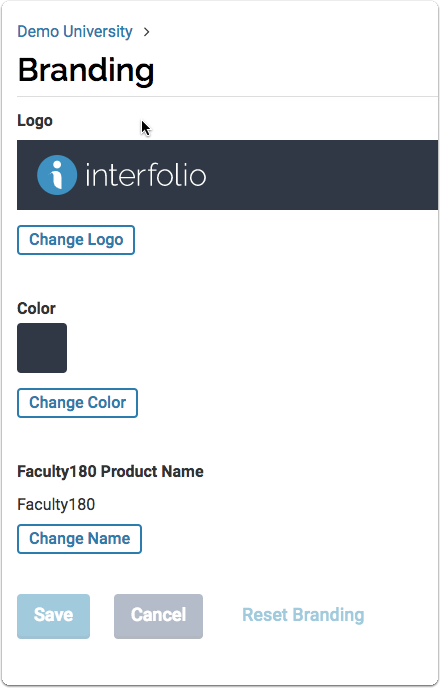 Customize and configure the color and logo for your Interfolio institutional homepage. *Only available to Institutional Administrators. Access your personal Interfolio account settings and basic information that is not affiliated with your institutional information. 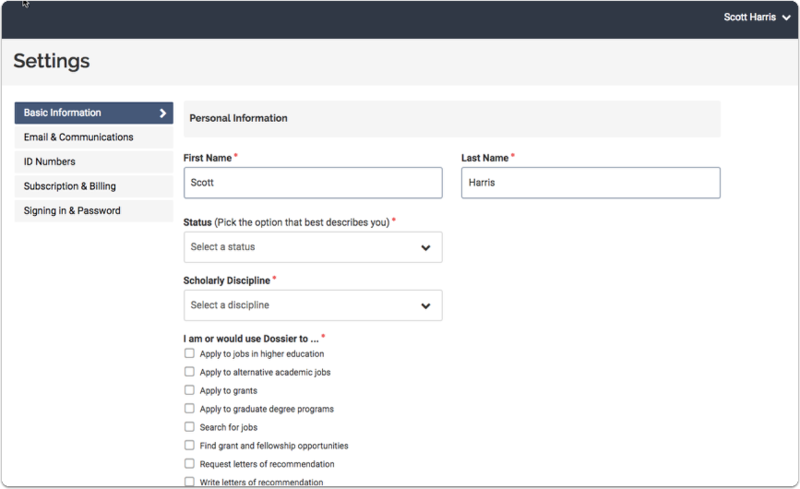 No matter what of Interfolio product your institution uses, you can customize the look and logo of your product with the branding tool available in the User Menu. The option will only be displayed to users with the proper privileges. Faculty180 institutions will have a link in the old branding location that leads to this new page, and also can relabel the name of the product. 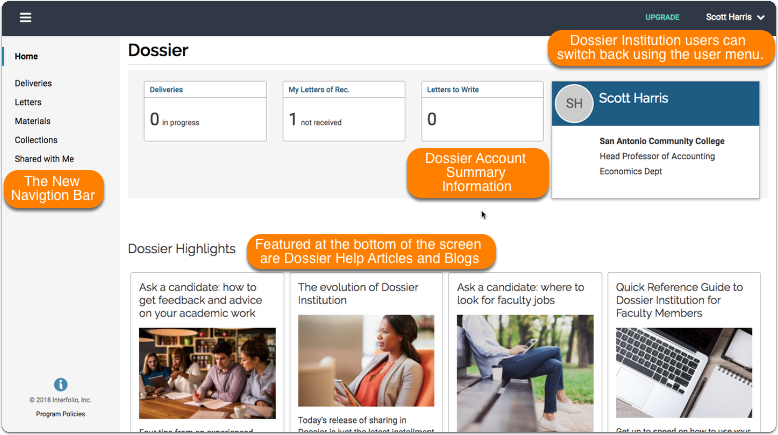 Important to note: All Faculty180 users now have access to their own personal Dosser to collect and manage their material for their career. All of these features and tools have new homes within the product and will be explained further below. 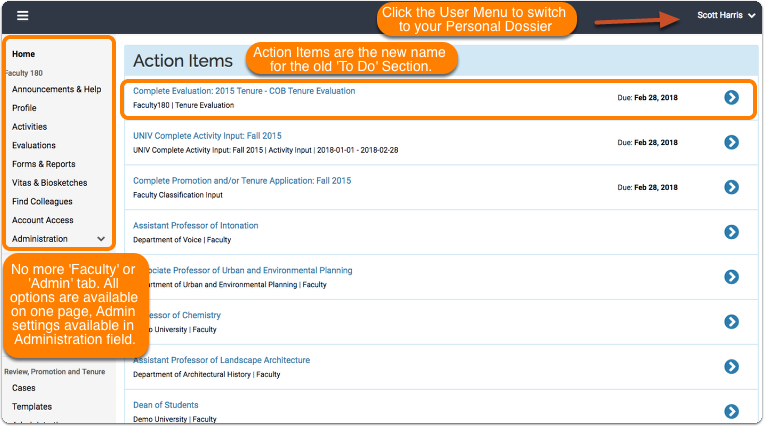 At this time, the Quicklinks tool will only be available within the Faculty180 product, this tool is not functional in Dossier, Review, Promotion, and Tenure, and Interfolio Faculty Search. Therefore, users will not see it on their dashboard, but if they navigate to ANY Faculty180 specific page via the navigation bar (displayed below) then the Quicklinks button will appear. For more information, click the link above to jump to the relevant content farther down in this article. View the previous section for more information. 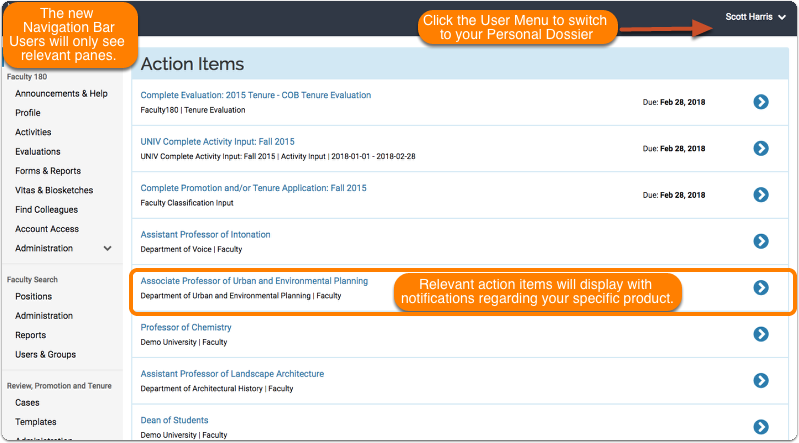 For users of Faculty180, the Action Items menu in the middle of the page will replace the To-Do section. This table will contain any relevant notifications or items that are in need of attention by the institutional user. Those who are familiar with the To-Do section should be familiar with the Action Items menu. Clicking on an item will bring the user to the relevant page. Below each new or updated Faculty180 page will be depicted and described. Note actual options may vary depending on institutional settings and administrator privileges. Both announcement panes will be moved from the homepage to the top announcements page, to be matched with other institutionally controlled content within Faculty180. This will centralize the focus to one page that users can easily see and access from the navigation bar. The institutionally controlled Help and the FAQ are located on the lower half of the page. Administrators have a rich text field to make announcements and link to outside content from within Faculty180. Faculty members can continue to ask a question in FAQ if enabled at the institution. The Forms and Reports page has been updated. Currently, we are in the process of finding a new data visualization service. The previous module, Logi, AKA 'Data Visualizations' pane, or the Faculty Analytics pane, is going to be removed. A replacement is expected to be found before the end of the year. Below is an example of the page with the available report sections collapsed. The number of reports available is the same as before the export. Based on client feedback, the find colleagues tool has been moved from the Homepage and it is now available on the navigation pane. Now users can see it from any place within Faculty180 and also the tool now has it's own dedicated page, as displayed below. As mentioned previously, the Interfolio Account Settings page contains information that is specific to a user's Interfolio account. The information that is displayed on this page is not associated with the information within their institution or in the Profile section. From this page, users can navigate to control how frequently they are emailed, and also any account information related to a personal Dossier Deliver account. A new "Jump to Section" button has been added to both the Activities form and the Profile form. With it, users can search and quickly navigate to the relevant sections within the form of exceptionally long pages. At the top of many pages with Faculty180 are breadcrumb links to help users navigate between windows on their path through the Faculty180 product. Simply click on the desired link to navigate to a previous page. Only institutions that provide their Faculty users with Faculty180 that have a Dossier Institution account will be able to export their CV directly to their personal Dossier for record-keeping purposes and future storage as a PDF document. 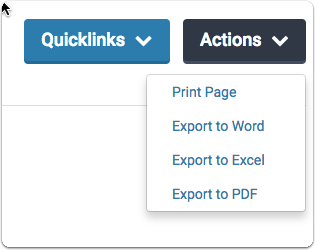 No longer small buttons at the top of the page, the export options on reports now have a prominent location near Quicklinks. 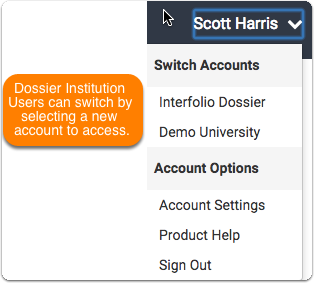 As long as you are logged into an Interfolio product, you can switch from your personal Dossier to any institution and vice-versa.